Your greatest single asset is your home, and its maintenance is an important part of homeownership. Maintaining your home requires frequent care and attention and can sometimes mean that you need to call a technician for help. With your busy schedule, you may not always have the time to address home repairs and maintenance, or perhaps you don't have the right tools or skills to tackle the job at hand. Sears Handyman Services can help. 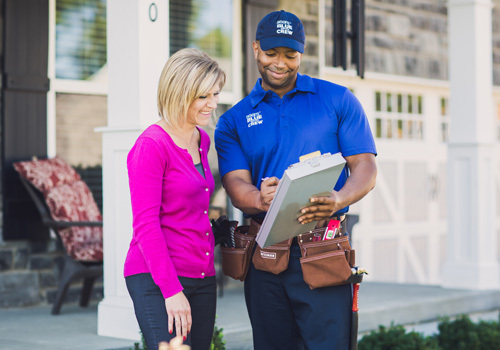 Our experienced technicians have the skills and equipment to get your repairs or renovations done right, whether you have a leaking faucet or want to build a new deck, a Sears Handyman can help. Give us a call at (512) 640-4061. Providing power to your home involves a complex system installed by a professional electrician. Minor electrical issues often don't require a licensed electrician; however they may be beyond some homeowner's skills. An experienced Sears Handyman can help. We can repair or replace LED lighting, track lighting, ceiling fans, and install recessed lighting. Contact Sears Handyman Services today for these and other electrical issues. Drywall is a common sheathing material. Sturdy and convenient, drywall is a great building material but it is easily damaged. A runaway door knob, nail holes and scuffs can leave your walls looking unsightly. For minor to major drywall repairs or replacement, contact Sears Handyman Services for help. Decks allow us to extend our home living space and enjoy the outdoors. These exterior spaces require a great deal of maintenance as they are exposed to the elements all year-round. A Sears handyman can help with your deck maintenance; whether it's sealing the deck surface or repairing wood rot. Our handymen can even refurbish your existing deck or build you a new deck from scratch. Fencing doesn't just define your property line - it adds privacy and value to your home. Sears Handyman technicians have the knowledge to build or install the right fence for your needs. Whether you want a privacy fence, a romantic white picket, or a cost-effective chain link fence, our skilled technicians can build it. A fresh coat of paint can breathe new life into your home while adding value; however, painting is time-consuming, and some homeowners don't feel comfortable on ladders. Sears Handyman Services can assist you with any of your painting needs, whether interior or exterior. Our handymen have the experience to remove old wallpaper, safely access those hard-to-reach places, and get your painting done right.